(All photographs in this article are copyrighted by the estate of Garry Winogrand) - I do not own any of these photographs! Garry Winogrand is an American street photographer and one of my favourite photographers to date. He’s well known for his portrayal of American City life and its social issues throughout the 1960’s and 70’s. 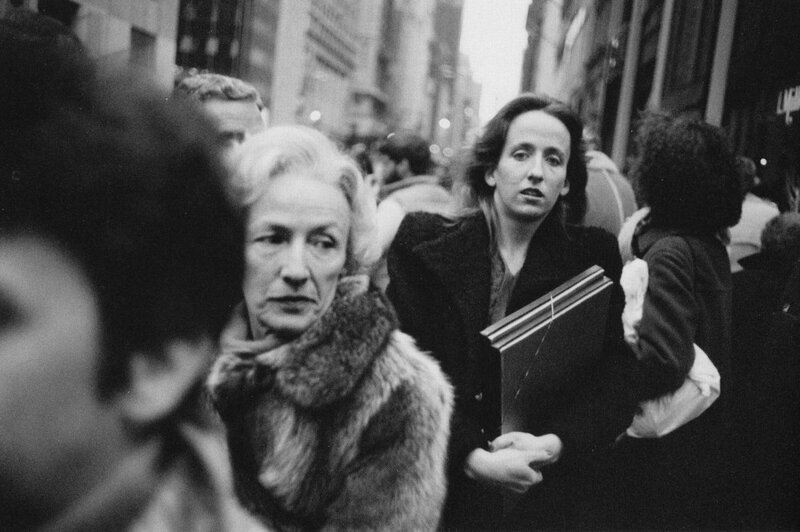 Winogrand shot a large body of his work in New York City. (and shot well over 3 million photographs in his career) By the time of his early death (in 1984) he left behind 2,500 rolls of undeveloped film and 6,500 rolls of developed but not proofed film. (meaning they had not been examined and made into contact sheets) The Garry Winogrand archive holds around 20,000 contact sheets and around 100,000 rolls of film. He and two other photographers (Diane Arbus and Lee Friedlander) were featured in the influential exhibition ‘new documents’ that showcased documentary photography, and was held at the Museum of Modern Art in New York in 1967. (The exhibition was curated by John Szarkowski) Winogrand went on to hold solo exhibitions there in 1969, 1977 and 1988. Szarkowsi called Winogrand ‘the central photographer of his generation’. Winogrand was more interested in the essence of photography than labeling himself as a ‘street photographer’. 1. Shoot as much as you can! In order to capture true ‘reality’ you have to photograph as much as you can, especially if you’re shooting digital. It makes it possible to capture hundreds or even thousands of photographs at a time, without the slight inconveniences of having to change & store film that Winogrand faced all the time. He truly was a digital photographer in the film era. Now when I say ‘shoot as much as you can’, I don’t mean that you sacrifice good composition or your own photographic style just to get another shot. I mean that you should shoot first and ask questions later! I think every photographer knows when they’re in the ‘zone’, when you’ve got the exposure just right and you believe every click of the shutter is going to produce pure gold. It’s at these points where you must take as many as you can, as the odds are when you look back at the photographs there will only be one or two that really stand out. You should embrace your emotion while photographing but remember that it’s never your emotion that makes a good photograph; it’s the way you compose your camera and place what is in front of you into a frame that is aesthetically pleasing. When I travelled to Nepal I took over 3,500 photographs, a mere speck of dust compared to the 3,000,000 + that Winogrand shot over his career. However out of the 3,500 I only selected around 35-40 photographs and out of that I’m only very proud of a select few. So the more opportunities you make use of, the more times you click that shutter or cable release and the quicker you are able to compose a photograph. The more of a chance that one of those moments has been ‘perfectly’ captured. Now when I say ‘perfectly’ I mean a photograph that has been composed in such a way that the majority of people can recognise it as art, as a master piece, as something that moves them in a profound way. Never put yourself down as a photographer, photograph for yourself and if you persevere there’s no telling what you can achieve! The world’s greatest photographs boil down to being able to use the equipment at your disposal effectively, and being at the right place at the right time. You never know, your prize winning shot could be right around the corner or in the next frame! You just have to be ready to pounce, like the great master himself. ‘’No one moment is most important. Any moment can be something.’’ – Garry Winogrand. He replies by saying ‘’Quickly, off the top of my head: Atget, Brassai, Kertesz, Weston, Walker Evans, Robert Frank, Bresson.’’ I have always believed that to broaden yourself photographically, it is essential to constantly engage your mind in all forms of photography. This is best done by going to galleries, reading photobooks and researching photographers work. The beauty of broadening your artistic mind is that it can be done through all art forms; photography, music, painting, sculpture and reading are among my favourites. If we take music as an example, I can very happily listen to the classical composer Francesco Sartori. I then however can switch to something completely different such as Shinedown, Korn or Slipknot. I am also a large Jazz and Reggae enthusiast. The point is that I find all of the music I listen to moving in different ways. I can listen from one end of the spectrum to the other and most things in between. It’s the same principle with photography, the more you look at different photographers work and absorb the connotations of their photographs, styles and techniques; the more your own photography will develop and improve. Moving forward in photography is a contrast been practice and the education in other peoples photographs. It’s important to engage with other photographers because you share a common passion and interest, whether it’s for company when shooting, or asking many different photographers to give a critique of your work so that you can improve. The only thing better than one trained eye is many trained eyes, observing and talking about one photograph and how it could be improved by the photographer changing their style or technique is a great way to develop your work. Winogrand made a habit of not developing his film after he shot; he would normally wait between 1 and 2 years!! He did this for a few reasons, the primary one being that he could approach his work more critically and not confuse a bad photo for being good, simply because he felt good or excited when he took the shot. Relating to a well renowned quote by him. Now why I don’t recommend waiting that long until you get to the post production side of photography, Winogrand makes a good point. The less you can remember about how you felt when you were taking the photographs the more critical you will be able to be with your photography. Meaning you are just dealing with choosing successful images rather than images that you enjoyed taking. Something Winogrand is excellent at, is shooting photographs that entice us, photographs that can tell a thousand different stories depending on how the viewer perceives his work. Looking at the photograph above, it’s a testament to the raw emotion that Winogrand captured, and a tribute to how he photographed with mystery. Who is that man on the phone to? Is this a call that will change his life in a big way or one that’s completely insignificant? 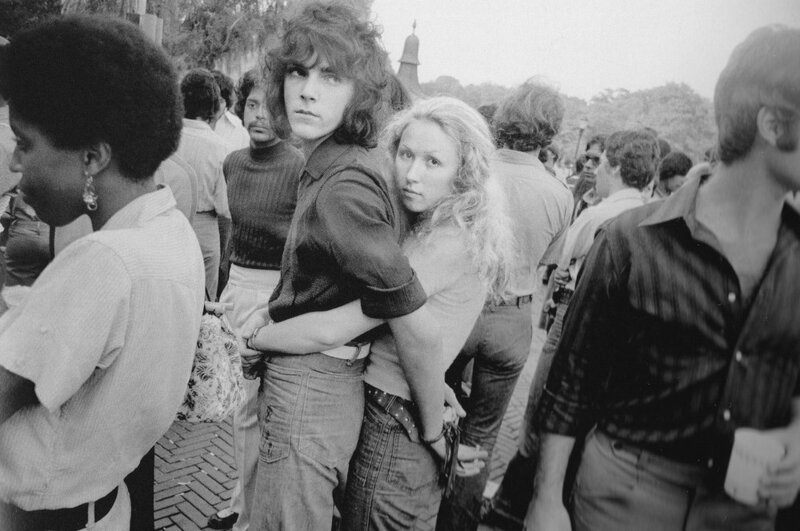 Winogrand has made the call significant to the rest of the world by framing that moment. 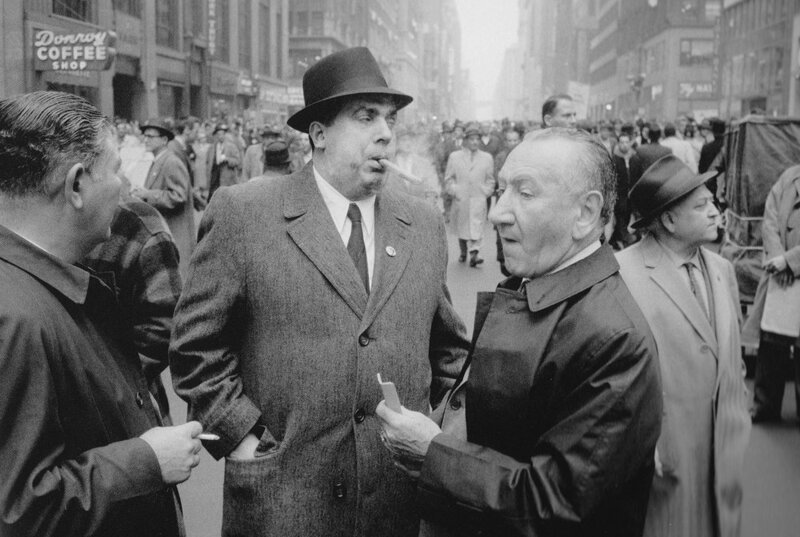 In an Interview with Barbara Diamonstein (1981–1982, Rizoli: New York ) Winogrand talks about how he finds mystery in the banal. Winogrand talks about creating a whole ‘new world’ by framing something. It’s this world where the mystery lies depending on what you chose to put in the frame. Although sometimes it’s as if the subject is so mysterious that it’s almost asking to be framed and it takes a good photographer to find those subjects. Winogrand famously shot with two Lecia M4’s both mounted with 28mm lenses. However for him to find the aesthetic he was after, he had to experiment with different equipment. Forexample he also shot with 35mm lenses and was known to go as wide as a 21mm. Although he favoured the 28mm as he wanted to get as close to his ‘angle of vison’ as he could without ‘mechanical distortion’ coming into his frame. For me it’s all about learning what equipment feels right to photograph with and what equipment produces the quality and aesthetic I’m after. For many of my portrait images I use my trusty 24-105mm canon prime lens, this is brilliant for a number of reasons, from the superb optics to the ideal range of focal points. I have been in few situations where when shooting a documentary portrait I haven’t reached for the 24-105. For me it’s just fantastic. If I’m looking for a particularly shallow depth of field or am after a lot of bokeh in an image, I use my 50mm 1.4 lens which is excellent for that soft aesthetic that is harder to achieve with other lenses. What Winogrand is referring to is that without the danger of failure you risk sacrificing anything that makes interesting subject matter. When you fail don’t let it set you back, the world’s greatest photographers have all experienced more failure than you or I can comprehend. It’s this failure that you must adapt to in order to become a better photographer. A true skill in photography however is selecting the photographs that aren’t ‘failure’, the photographs that intrigue and force you to feel, the photographs that you will be remembered for! Winogrand is perhaps most famous for the sheer volume of photographs that he took, he was never satisfied and shot almost every day. He knew that he would never see everything he photographed, as he would only develop after a year or two of shooting, but none of that mattered to Winogrand. He was more a lover of the medium and the process than anything else. His peers often fondly speak of his uncontrollable energy when it came to photography, whether it was waking up at the crack of dawn to go out and shoot. Or staying on his feet all day wondering through New York immersing himself in his element… The Urban Jungle! For me photography is a passion, something that I can wake up in the morning for, something that excites me at the very thought of grabbing my camera and going out to shoot. Of course I one day hope to turn this into a career, because I want to love what I do and I love photography! Much like Winogrand who shot for himself first, I highly recommend you photograph for the hell of it and do it because you want to. If you have ambition behind you, there’s no telling what you can accomplish! ASX, Editors. (2012). Monkeys Make the Problem More Difficult. Available: http://www.americansuburbx.com/2012/01/interview-monkeys-make-problem-more.html. Last accessed sep 19th 2015. Meyerowitz, J. (). Bystander: Foreword. Available: http://www.joelmeyerowitz.com/photography/book_6_foreword.html. Last accessed sep 19th 2015. Diamonstein, B. (1981-1982). An Interview with Garry Winogrand.Available: http://www.jnevins.com/garywinograndreading.htm. Last accessed sep 19th 2015.